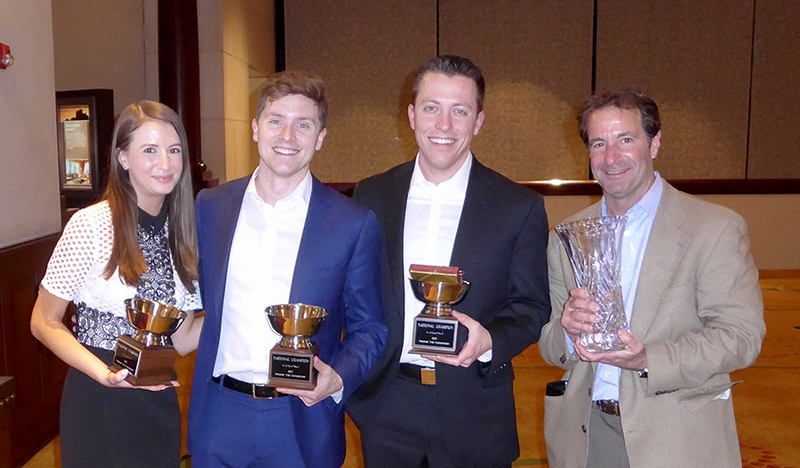 A Northwestern Pritzker School of Law team won the national championship in the National Trial Competition held in Fort Worth, Texas, March 23 to 25. Stacy Kapustina (JD ’17), Douglas Bates (JD ’17), and Garrett Fields (JD ’18) took first place in a field that originally included 300 teams in 14 regions. At the finals, the students representing Northwestern’s Bartlit Center for Trial Advocacy, defeated teams from Temple University Beasley School of Law, South Texas College of Law, The University of California, Berkeley, School of Law and two teams from Georgetown Law on their way to the eventual championship. The National Trial Competition, sponsored by the Texas Young Lawyers Association and the American College of Trial Lawyers, is the oldest and most prestigious trial competition in the United States. Bartlit Center teams have now won the competition five times, which ties for the most of any law school. The previous championship wins came in 1992, 1997, 2002 and 2011. The Bartlit Center team was coached by Richard Levin of the Levin Riback Law Group. Levin also coached the 2011 championship team. Steven Lubet, the Williams Memorial Professor of Law and the director of the Bartlit Center for Trial Advocacy, said the trial teams have a great winning tradition. “We are especially proud because our students always approach these competitions by putting educational values first,” he said.